Edit: An updated version of this chart has been published! It's useful to be able to recognise the weapons on a ship simply by looking at it - it lets you figure out roughly what someone's fit might be before you actually engage them, and can help you decide the best way to proceed in a fight. Recognising the difference between blasters and railguns, or medium and small guns on a cruiser, is likely to have a significant difference on the range you want to engage at or even whether you want to take the fight at all. Even different calibre guns within the same class can give you an idea of what other modules your opponent might be fitting (for example a rupture with 425mm autocannons will almost always be shield fit, while dual 180mm autocannons suggests a heavy armour tank). 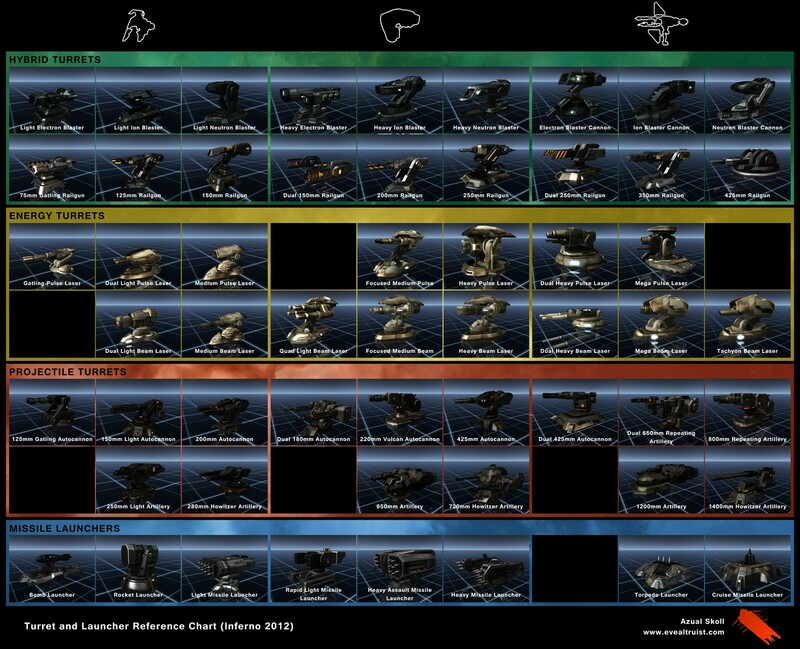 To help with identifying weapons visually, I put together a chart of all the subcapital turret and launcher models. Have a browse through it, and then try looking at a few ships in space and see if you can figure out what they're fitting! Update: Some people have asked about printing it to put on the wall. If you want to try it, here's a high resolution version which should look much better in print. I second the love. I have had SO MUCH trouble with the new turrets. Than you for this! Would be great if you could rework this including T2 variants. I only say this as I finally got round to putting T2 Neuts on a Thorax the other day, and they use the same model as the one you've listed for T1 Electrons. It shouldn't, sounds like a bug - maybe try clearing your cache? All the images above are the t2 variants. The models are identical to t1, just with a different colour scheme. The only model I know of where the t2 gets a seperate model is the salvager (t1 and t2 salvagers look nothing alike)! Strangely the dual 150mm Railgun doesn't look like 2 150mm railgun side by side. Thanks again man, it's very helpful to have them all in one place. Out of the park mate, thanks. 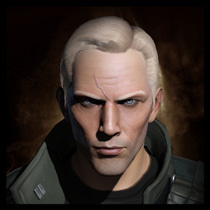 Now if only CCP could give us that Picture-in-Picture functionality Torfi promised at Fanfest so we could more easily focus on enemy targets, that'd be perfect. Is there any consistency to the colour variations according to meta level? That would greatly assist the advanced-level turret geek. I noticed some colour variations on the various grades of heavy launcher, but I'm not sure if this works across the board or if it's a usable method to identify faction/officer modules. Would be cool if so though. I haven't looked at named modules, but t1 and t2 have consistent colour differences for each type. In general the t1 are similar to the t1 hull colours for the associated race (grey/beige/brown/grey respectively), while t2 tend to be darker with lights/trim in a more ominous colour - similar to the difference between t1 and t2 ship colour schemes. 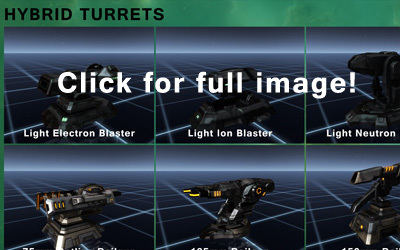 The most obvious example is railguns, where t1 is grey with blue lights, and t2 is black with orange lights. If each meta level is different, that *will* be interesting. I haven't noticed anything, but didn't really think to look - I'll have to take a look at them more closely later. This.. article... it's soo beautiful. I happen to be very late with this comment, but meta weapons do have colour highlights. For example, arbalest launchers have red highlights. T2 weapons also tend to look like the standard T1 but with little more detail, like a couple of lights. I've found this handy in target identification - if they're using the basic t1 weapon they're likely to be an easier target as meta 3s are practically as cheap as the base in some cases, though not with the meta 4s. You can also tell what ammo the target is using - they have different colours. This is most observable with lasers, but you can see it in projectiles, their colour changes a bit, and with hybrids the shade seems to change though this could be my imagination. I will test further.